Scott Kalitta was 2 time NHRA top-fuel champion and winner of 18 career races. This crash happened Saturday during the the final qualifying round. The drag race is the Lucas Oil NHRA SuperNationals and the event is held in Englishtown, New Jersey at Old Bridge Township Raceway Park. 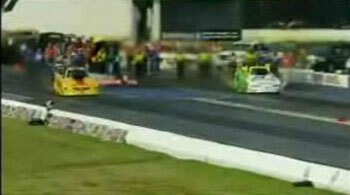 Scott Kalitta was moving at 300 mph in his DHL sponsored funny car. Scott Kalitta, 46, was a resident of Palmetto, Florida.